SAL DeTRAGLIA'S VIRTUAL TAPAS BAR: LOOKING FOR COMEDY IN THE SPANISH-SPEAKING WORLD. Someone once said that, “A little knowledge is a dangerous thing.” That’s especially true when “little knowledge” pertains to a foreign language. For those of us who were not born with the linguistic gifts of the average Belgian, navigating the peaks and valleys of daily life in Spain—in Spanish—can be fraught with peril. Peril, that is, not to the body—but rather, to the ego. Why? Because in the hands of the lazy or ill-prepared, a little knowledge of Spanish can lead to, at best, a good laugh—and at worst, an acute case of foot-in-mouth disease. Here are some examples of what I’m talking about. Many of these were taken from my own checkered history of bilingual ineptitude. Others (particularly the less naughty ones) were the products of a brainstorming session with my good friend, fellow US expat and Vaughan Radio on-air personality, Drew Crosby. Why-oh-why some misguided marketing executive decided to name a brand of whiskey after the English slang word for male genitalia is beyond me. Perhaps he viewed globalization as passing fad. Spelled differently but pronounced the same, the term “whiskey Dyc” in English slang means—are you ready for this?—alcohol-induced impotence. Ironic, isn’t it? That which Spanish men routinely request, their English-speaking counterparts routinely deny. The Spanish phrase “Estoy constipado/a” means that the speaker’s head and chest are congested—usually due to a cold or allergy. But its English cognate (i.e., “I am constipated”) means congestion of quite another sort. Of course, none of my Spanish professors bothered to explain this subtle yet important distinction...and the results were predictable. I was working in a large law firm in Barcelona, and sharing an office with another lawyer. My office-mate was a woman of immense beauty, elegance and professionalism. One morning during the month of March, she entered the office and slouched in her chair. “Not very well,” she answered. I sat there for several seconds, frozen in shock. And then, sensing an awkward silence, I uttered the first response that popped into my head. Pregnancy is a time of great joy. It’s certainly *not* a time of embarrassment—unless the father happens to be one of those idiots from Gran Hermano. Confusing, isn’t it? I suspect that I’m not the only man in Spain who has announced his pregnancy at a crowded dinner party. Even the wholesome world of ice cream can be a minefield. Take the Spanish word “cucurucho.” It sounds like the name of that wiry guy who delivered pizzas when you were a grad student in New Haven, Connecticut. 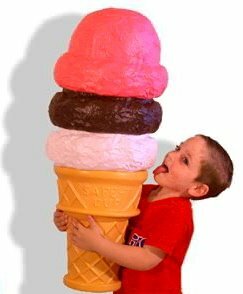 But in fact, cucurucho means a cone for ice cream. Let me be clear about one thing. This word does NOT mean cone. In Spanish, coño is [ahem] a gynecological term—but one so vulgar that no respectable gynecologist would dare utter it outside the confines of a bowling alley. And it’s a word that I misused once, and only once. I was in the seaside town of Javea; between Valencia and Alicante. It was a hot summer day, and I spotted a cafeteria with an ice cream bar. I flagged-down a waitress. “Would you like it in a bowl?” she asked. Bless the professionalism of that presumably underpaid waitress. Looking down at her shoes, she briskly plopped two scoops onto a sugar cone. Only her furled brow and quivering lower lip hinted at the tsunami of repressed laughter that struggled to unleash itself from the confines of her convulsing throat. When I was told of my error later that day, I had only one thought. Thank God that I opted for coconut ice cream, rather wild cherry. On a separate but equally-important note, take care to use the correct gender when ordering chicken in Spanish. A “ganga” is not something to run from. It’s something to run toward. An “éxito” is not a way out. It’s a way up. A “carpeta” isn’t something that’s thrown onto the floor. It is thrown into a drawer. And always remember...“cucurucho” means cone. Ahhh...fond memories of my first few years in Spain and the horrid mistakes I made. I always had to laugh at whishey Dyk...and who could forget Gin Fockink. Nothing like mixing Dyk and Fonkink. One of my biggest gaffes was at the Polleria...I wanted to buy chicken, and wondered why the lady was laughing so hard after I asked for a polla. Afterall- I wanted to make sure I got a hen, not a rooster. Ooops. But that pales in comparison to getting one's icecream in a coño... though helado en un coño might be fun to try. Ironporer, my hometown pal! :) That last comment of yours made me crack up (and blush)... lol. Sal... I just wrote a longer comment and my compter ate it. Damn. I feel your pain. I think I kept a running list on my blog of the dumb things I said while in Spain -- and those were only the ones I knew about! (June/July '04, if you're bored.) But my Spanish friends who tried speaking English were equally challenged at times. I'll never forget my host father, Victor, coming out to the patio after dinner one evening with a plate of fruit, and asking carefully in English, "Angela, would you like a plumber?" In other news -- how is Spain in early November? I wanted to come this summer, but plane tickets are twice as expensive in the summer as they'd be in November... plus it would give me more time to save up some cash. My Spanish mama is already preparing my room in Madrid. Maybe I will even swing up to Guadalajara to see the windmills...? Of course, it all depends on the powers-that-be in the office who control the six lousy vacation days I have left in 2006. We'll see. And you convinced me about avoiding speaking 'my version' of Nederlands aloud ... I get enough irreverent comment regarding my kiwispeak. Just kidding, it was a superb post. That's so funny and makes me more aware of words and language! Iron Man: If any of your past girlfriends called you "The Good Humor Man," now we'll know that it wasn't because of your gregarious personality. Ang: Hey! You're coming to visit (or re-visit) our fair country? November can be an OK time. Of course, your risk of encountering rain is greater than at other times of the year. We had several days of hard rains during each of the past two Novembers (I know, because my roof leaked and cost 4,000€ to fix it), but then again...there were also plenty of good days. But even if it rains, so what? You're still in Spain and it will be a helluva lot warmer than in Chicago. Obviously, October is a more stable month. But hey...it's weather. Even in July, there can be bad weather. Might as well take the risk with cheap tickets. BTW...forget windmills. If you venture into Guadalajara, you can finally try some goat. I'll buy. Lady Di: Yes, I was Catholic at one point in my life. And I am consumed with guilt (or is it "quilt?"). But for me to send you a bottle of whisky, there's a stipulation. A six pack of Orval must be heading in the opposite direction. Traveller One: There's a downside to being too aware of words and language. You become afraid to use them. Ignorance is indeed bliss. Educate me. I don't think I've ever heard of Orval. Are you suuuuuuure you're living in Belgium? Or is it BelAir? If you haven't tried it, you should. It's even better than some wines. Over breakfast I might have enquired about Orval and discovered this fact. Are you aware of how many beers there are here ... and I have had Jenever and various other local spirits forced upon me during my time here. How I suffer lol. Sigh ... I didn't consider you making a counter-offer, I was merely pursuing and hoping to develop a deep feeling of guilt within your soul re: my nederlands silence. Anyway, if I were to sehd Orval I would enclose peanut butter as well, which surely explains my confusion ... I did wonder if it was a brand of peanut butter. Better than wine ... I don't consider that possible. Angie, hope all is well back in ACDville. I need to get back up there. You asked Sal about November in Spain- due to the airline pricing that is when we typically go and it is actually the BEST time IMO. Cool weather (we don't do playa and hot if we can avoid it) and hardly any obnoxious Americans/other tourists milling about. Our favorite place so far is San Sebastian (Donosti to 'friends'). This fall we hope to spend a week near there at a Pension Rural- the only way to go in our opinion, and then stay a week in Galicia at another PR. If you never have done the PR thing, look into it- they are great!! Estoy constipado/a is much worse for the Spanish speaker using the false cognate than the other way around. Imagine my husband's embarrassment when he actually said the words "I'm constipated". By now, both sides of the family are familiar with the weird things that pop out of our mouths. I once asked my mother-in-law (in Donosia) if she wanted to go to the beach with me "con yo". Oops! Not that using language like that is really a problem there. It's just better to know what it is you're saying, so that you can exclaim "cojones!" with feeling (and not a dresser drawer--a word I've learned to stay away from).